Making the Big Sabine hike on Santa Rosa Island in February was COLD! A front had pasted over the day before and temp was in the 30’s with a north wind. 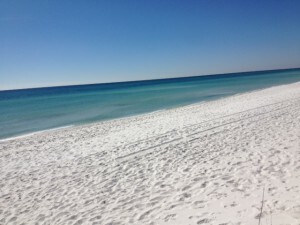 But the sky was a beautiful blue and the Gulf was calm and clear. 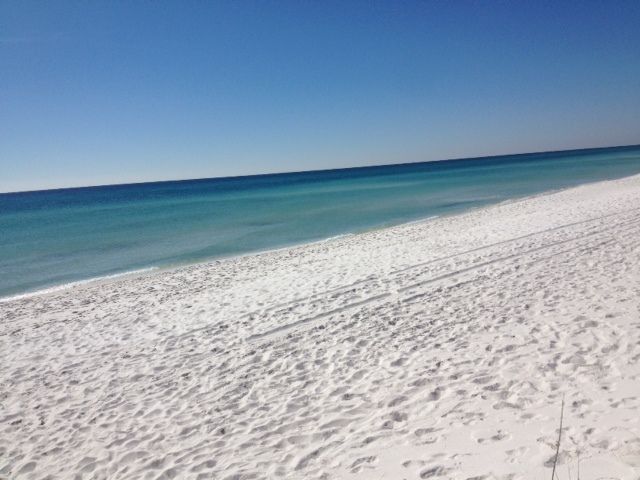 The Gulf is smooth and clear most winter mornings. Wildlands Environmental High School from Wisconsin making a dune hike on a cold Florida morning. 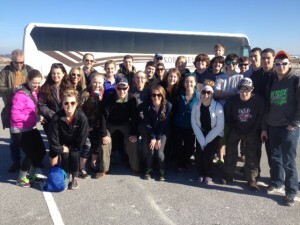 Joining me on my hike this month was the Wildlands School from Wisconsin. They were visiting the Gulf Coast working on a variety of projects and wanted to learn more about coastal ecology… so I brought them along. Because of the drop in temperature we did not see much wildlife. In January I saw very little other than birds. In February we saw few birds… it was really cold. 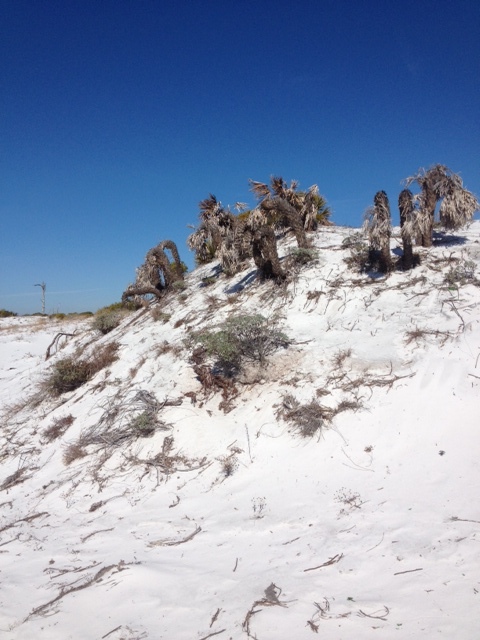 As we hiked from the Gulf to the Sound we discussed barrier island and dune formation and showed many of the plants common in the different dune fields we mentioned in our January issue. Most were brown in color but there were a few evergreens and we even had one secondary bush blooming! Beach Heather (Conradina canescens). 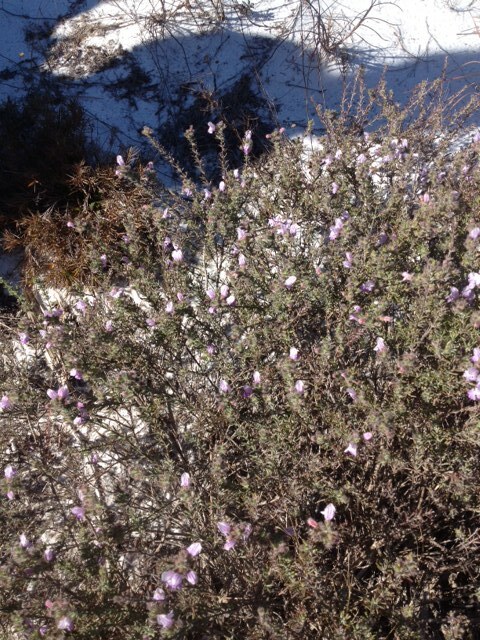 Beach heather (Conradina canescens) blooming early in the year on a cold morning. 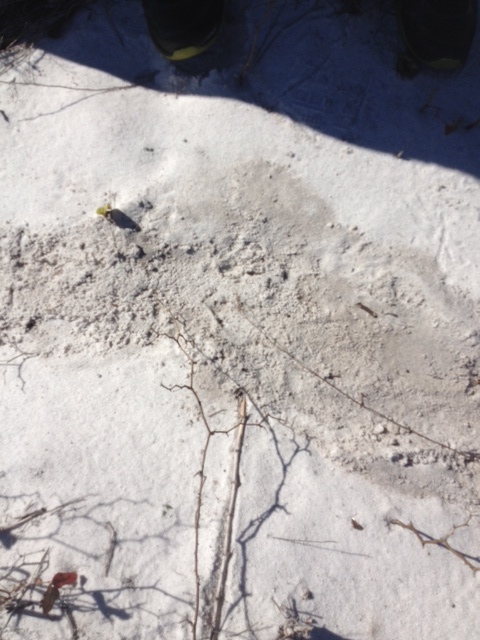 We did see a few mammal tracks and had a chance to discuss “animal sign” with the students, but no live animals were seen. 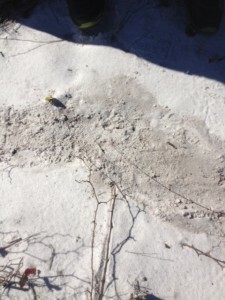 The kids from Wisconsin were introduced to cactus (literally… many had it on their shoes) as we walked through the maritime forest and I had a chance to explain the xeric conditions found on our barrier islands and how this favored particular plants and animals. While in the maritime forest we also came across an old aquaculture facility and this gave me a chance to discuss this industry as well. But for me the most interesting discovery in the maritime forest was a “drag-line” that I had found in January near one of the ponds. As we walked past this area again – it was there again and seemed to be “fresh” (recently made). I am not sure what makes these drag marks – have a few guesses – but am hoping to discover the source before the end of this series. Strange drag marks we have seen each month so far. They are found near one of the ponds on the Sound side. Despite the north wind the Sound was calm and clear. 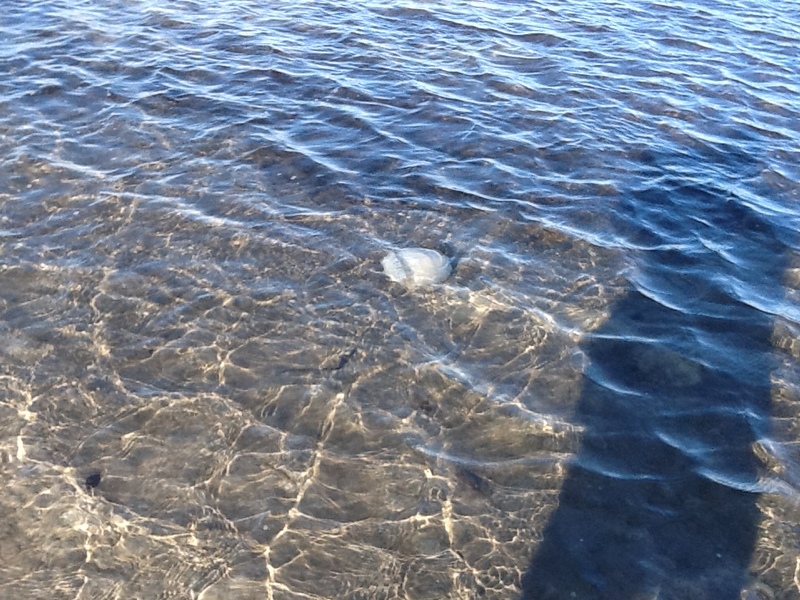 Most of the marine creatures had moved into deeper-warmer waters but we did find a dead cannonball jellyfish. The students from Wisconsin got a chance to hold the slimy creature and we discussed how the stinging cells (nematocyst) work. These small cells on the tentacles of jellyfish have a triggering mechanism that is actually discharged by the object that touches it… the jellyfish does not do this. Once the trigger is moved a dart with a drop of venom is discharged into whatever triggered it. Several of these firing at once is what causes the pain we feel, or the death of a small fish. They were also excited to discover a primitive camp site that locals use. I explained the correct protocol for doing this and hope that locals do the same. I found this along the shore last winter. 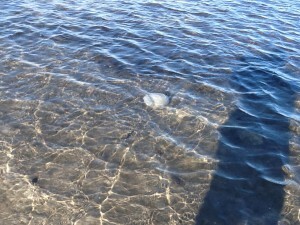 These are cannonball jellyfish. Though there was not a lot of wildlife to view in February but the beach is absolutely beautiful this time of year. The sunrises and sunsets are amazing. I encourage local “panhandlers” to visit your local island and take a long walk. I think you will enjoy it. Teaching Tired Old Turkey to Swim! Holiday dinners usually feature ham and turkey. You may start having left-over sandwich nightmares after eating turkey for the next six weeks! Many Florida families choose fresh seafood as a delicious and healthy addition to their traditional holiday meals. This is a great time of year to purchase and enjoy seafood. There is quality fish, shrimp, and shellfish currently at your local grocery store or seafood market. Usually with the holidays, there’s more time to explore new recipes in the kitchen. Fresh ingredients are the key to any good recipe and helps ensure healthy eating. The National Oceanic and Atmospheric Administration (NOAA) FishWatch website (www.fishwatch.gov) provides consumers with information regarding seafood nutrition, safety, and sustainability. 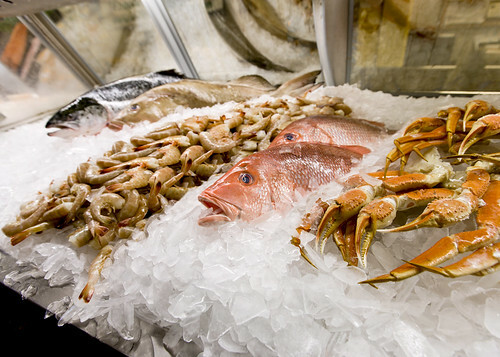 To be sure the safety of seafood is being properly preserved, only buy fish that is refrigerated or properly iced. Fish should be displayed on a thick bed of fresh ice that is not melting and preferably in a case or under some type of cover. Fish should be arranged with the bellies down so that the melting ice drains away from the fish, thus reducing the chances of spoilage. Fish should smell fresh and mild, not fishy, sour, or ammonia-like odors. A fish’s eyes should be clear and bulge a little (except for a few naturally cloudy-eyed fish types, such as walleye pike). Whole fish and fillets should be firm and spring back when pressed. Fish should have shiny flesh and bright red gills free of slime. Dull flesh could mean the fish is old. Note: Fish fillets that have been previously frozen may have lost some of their shine, but they are fine to eat. Fish fillets should display no darkening or drying around the edges. They should have no green or yellowish discoloration and should not appear dry or mushy in any areas. Fresh Florida Oysters are almost as popular during the holidays as pecans and walnuts; they are just a little more difficult to crack! Oysters are a welcomed addition to any meal, as side dishes, appetizers, or snacks between larger meals. You’ll enjoy finding great ways to prepare this nutritious shellfish. Preheat oven to 325° F. Drain oysters; reserve liquid. Remove any remaining shell particles. Chop oysters. Cook celery and onion in butter until tender. Add oysters and oyster liquid to vegetables; cook for 10 minutes. Combine oysters, cooked vegetables, bread cubes and seasonings in a large bowl; mix thoroughly. 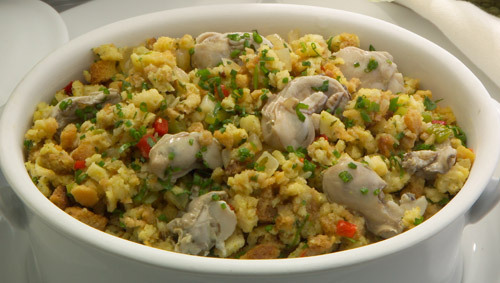 If stuffing seems dry, moisten with additional oyster liquid or chicken broth. Bake dressing in a greased casserole dish for 30 minutes. Please save the date for the 2013 Northwest Florida Regional Artificial Reef Workshop sponsored by Florida Sea Grant and FWC, to be held at the Niceville Community Center in Niceville, FL on Wednesday-Thursday, February 6-7, 2013. Registration details are still being worked out and will follow soon with a draft agenda, incorporating the suggestions received through the on-line survey. Please complete the survey no later than noon on Friday, October 26th, 2012. Feel free to forward this information as appropriate. We hope to see many of you on February 6-7, 2013.